Do you ever use your good china and silver? If you’re one of the few who do, do you still love the pattern you picked? When you chose your china pattern, you likely were in your 20s and thrilled about “playing house.” But tastes change, styles change, and your life changes. Guess what? You don’t have to keep the china pattern you registered for 10, 20, or 40 years ago! You didn’t pledge to “love, honor, and cherish” your china, did you? If you don’t use your china every day, and you still love the pattern, start using it. Most modern dishwashers have a gentle cycle that is perfectly fine for most fine china, so you don’t have to hand-wash it. You’re not enjoying it when it’s stuck in a china cabinet…and if you’re thinking it will become an heirloom for your kids, think again. Let your kids make their own choices, when and if they want to! Be bold, and let it go. 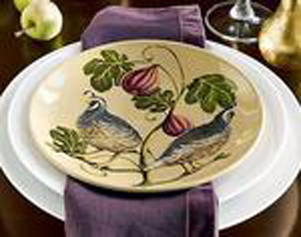 Sell your china on ebay or to Replacements, Ltd. Take the money you make and invest in a new china pattern you like, or buy funky, fresh patterns in microwaveable, dishwashable stoneware you can find at places like Target, Pier 1, Pottery Barn, etc. Innovate. Mix your own china with pieces from your grandmother’s set, or from a new (or antique) pattern you love. I do this a lot – my pattern, a white one with pink stripes and a gold border, looks cool with my grandmother’s, which is a floral. I also use some of my great-grandmother’s pieces, too! And one more thing? Don’t be afraid to let your grandmother’s china go, especially if you honestly don’t like it. If it has real sentimental value, keep just a few pieces – like dessert plates –but sell the rest! It’s not disrespectful to your ancestors to make your own choices about what works in your home. Give yourself permission to get rid of things that are wasting space, and reinvest in pieces you will use and love every day!